Enter the Raffle to See the Live Next Great Kosher Chef Competion! The Center for Kosher Culinary Arts’ (CKCA) search for The NEXT GREAT KOSHER CHEF concludes with its final round on Sunday, December 12th. Three finalists will compete in a filmed competition at the Entrepreneur Space in Long Island City, NY, for a full scholarship to the CKCA Winter 2011 Professional Program in Culinary Arts (Cash value: $5,000). 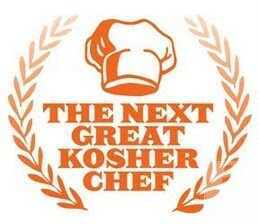 Besting the other competitors in the competition will also grant the winner the title of NEXT GREAT KOSHER CHEF. The three finalists are Jasmine Einalhori, of Los Angeles, Calif., Batsheva Goldstein, of Brooklyn, NY, and Josh Pashman of Manhattan. These finalists faced stiff competition from many applicants and they have already survived a grueling application process, which indicated they possess strong kitchen skills and a passion for learning, while confirming their status as “amateur” chefs. Biographies about the finalists appears at the end of this release. The December 12th finalist competition has three parts: a written exam, a series of surprise culinary challenges, and a final market basket challenge. Three judges will preside over the final market basket challenge, which is an “Iron Chef” style cooking competition in which the participants will create several dishes on a timed basis with the materials they are provided in a market basket. The event will be professionally filmed and will be made available to the public shortly. The public can enter here to win two free tickets to the limited space live event.